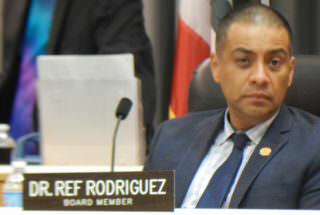 An independent city panel gave the LA Unified school board members a 174 percent raise on Monday night, from $45,627 to $125,000, but according to new board President Ref Rodriguez, it was an unexpected development. Rodriguez gave up his job as a charter school administrator when he ran for the office, and in his first year on the board he took the part-time salary of $26,346, as did three other board members at the time. George McKenna, Scott Schmerelson, and Richard Vladovic — who retired from LA Unified after careers in teaching and administration — have been serving on the school board in the full-time capacity and earning $45,637, which is comparable to the pay rate of a beginning LA Unified teacher. They are expected to continue as full-timers. 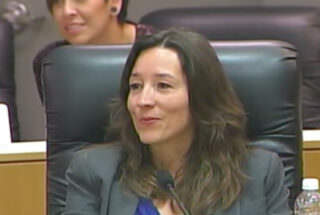 García disclosed that at the LA County Probation Department she makes $110,892 a year as head of commission services. The school board pay raise also boosts the part-time salary to $50,000. Jefferson Crain, the board secretariat who handles the school board meetings, said the board members can change their status month-to-month. Past school board members Mónica Ratliff and Steve Zimmer took part-time salaries, even though they were working full-time hours for the school board. But Zimmer was committed to his college teaching duties as well as long hours for the board — he was working at 10:30 the night in December 2015 when a threatening bomb scare email came to him that ended up closing the whole school district down for a day. Ratliff took a job as a teacher in a nearby school district, and she lobbied for the school board pay to be increased even though she is no longer on the board. Mónica Ratliff lobbies for a school board raise. In recent history, the only person who had a full-time job outside of the district was past school board member Tamar Galatzan who works as an assistant city attorney. She was beaten by Schmerelson, in part, because some constituents thought she wasn’t accessible. Ratliff noted at Monday night’s meeting that “people don’t like it as an excuse that you’re working, even as a teacher” when they wanted to talk to a school board member. She said her constituents didn’t like it when she had to delegate staff members to attend meetings. “People didn’t like that, they expect you to be on call 24-7 every day of the year,” Ratliff said. “You have to be independently wealthy or retired to serve the way it is now.” She said trying to make it on a $45,000 salary was difficult. Ratliff said she thought the school board salaries should be at least equal to the city council seats, earning $191,000 a year. Yolie Flores, who was elected in 2007 to the school board, said she didn’t run for re-election in order to make enough money to send her nephew to college. Rodriguez appreciated the two former school board members speaking to the committee but said he expected the salaries to remain the same. “I don’t know if we need to be making as much as a city councilman, but our districts are bigger than the council districts, and we do serve a lot of students and schools. I have more than 200 schools in my district, and that doesn’t count the charter schools,” Rodriguez said. The pay raise decisions are not made by the board or the superintendent, but by the independent Board of Education Compensation Review Committee, which meets every five years. It’s the first time in 10 years the committee has given school board members a raise. The salary funds are earmarked in the district’s general fund and are fully compensated by the state of California. Board members for the largest school district in the country, New York, are appointed and receive no salary. Salaries for California state Senate and Assembly are $104,000 plus per diem. * This article has been updated to add statements from Mónica García and Efren Martinez and to correct Tamar Galatzan’s present job.